Historical Dictionary of British Intelligence (second edition), Nigel West, Scarecrow Press, Lanham, Maryland, 2014. 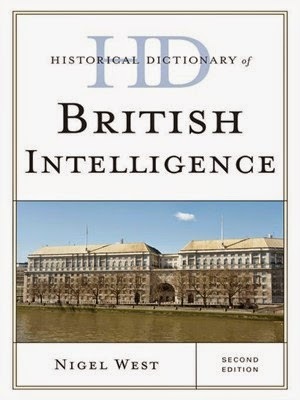 As the name indicates, this is dictionary style book that gives short summaries of various people and places related to historical British Intelligence. The first edition was published in 2005. This style of book is generally a great reference resource, with a myriad number of short, topical extracts. Unfortunately, the short section on Josef Jakobs contains some factual errors. JAKOBS, JOSEF. The only German to be executed by a firing squad in the Tower of London during World War II, Josef Jakobs was an Abwehr spy who was arrested soon after he had parachuted into a field near Ramsay in Huntingdonshire in April 1942 [Correction - landed 31 January 1941]. He badly fractured his leg upon landing and, after an initial interview at Camp 020, was treated at Greenwich Hospital [Correction - treated at Dulwich Hospital]. Under interrogation, Jakobs revealed that he was a Wehrmacht officer [Correction - he claimed to be an officer during WWI but said he was a corporal during WWII] who had been decorated in World War I and subsequently had pursued a career as a dentist and typewriter salesman. He claimed to be part of an anti-Nazi organization in Germany and asserted that he had only accepted recruitment by the Abwehr in an effort to reach the United States. He admitted having been imprisoned in Switzerland before the war when caught in a financial fraud and acknowledged that he had embezzled funds from Jews desperate to emigrate. Jakobs offered to cooperate with MI5 and, when confronted with Karel Richter, confirmed having met him in Hamburg while undergoing espionage training. Sentenced to death by a court-martial, Jakobs was shot on 14 August 1941 [Correction - Executed 15 August 1941]. Interestingly, elsewhere in the book, under Executions, the date of Jakobs' execution is correct, 15 August 1941. The article on Josef Jakobs is necessarily short and it is unfortunate that it contains the errors that it does. The remainder of the book may be different. 2 out of 5 - The piece on Josef, while short, is not all that accurate.